Crescenta Commons, now maintained by ASTER, continues to have tremendous support from the community. The local American Legion and VFW have stepped in twice now to help maintain the American flag. 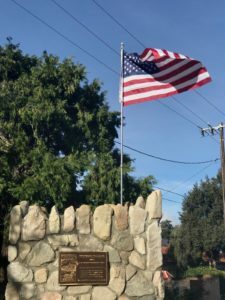 The first flag was installed to acknowledge the 911 tribute sponsored by the local Crescenta Valley Chamber in 2014. The flag became tattered from the weather especially the high winds and was in need of replacement. The call went out and the American Legion along with the VFW helped not only add a new flag but a new pole as well. Unfortunately in 2016 the flag was once again destroyed by the high winds and needed to be removed. On February 4th, 2017 a new flag and pole was installed. When the picture and announcement was posted to Facebook and the La Crescenta official page the community showed their ongoing support with loads of shares, likes and hearts. La Crescenta loves Crescenta Commons and especially old glory. Enjoy! Please drive by or pack a lunch and go enjoy the site. Corner of Rosemont and Orange in La Crescenta.